Determine how long you want your child at school and what location is best. Some parents would rather have preschool closer to their work. Others choose preschool in their hometowns so their children will attend the same elementary school as their peers. According to Child Care Aware of America, many types of organizations offer preschool programs, including schools, churches, non-profit organizations and child care centers. Some preschools provide half-day classes a few days a week to ease your child into the school experience, while others offer full-time programs that offer classes up to five days a week. Finding a school that aligns with your view of how education should be approached also is important. This is a great question to ask the program administrator during a school tour or open house. Find out the school’s educational philosophy, and see if it aligns with your beliefs. Most programs will use a standardized curriculum and integrate the arts, science, outdoor learning, and play. Others may be constructivist or project-based programs, and may have a more child-directed approach. According to the American Montessori Society, an advocacy organization, “Montessori classroom is prepared by the teacher to encourage independence, freedom within limits, and a sense of order. 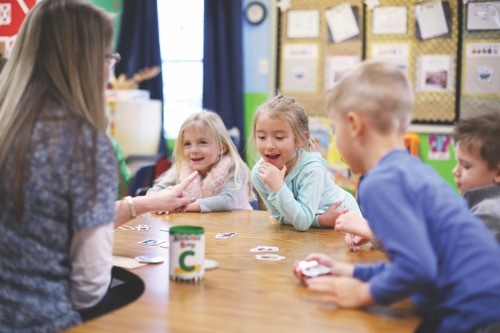 In early childhood, Montessori students learn through sensory-motor activities, working with materials through direct experience: seeing, hearing, tasting, smelling, touching, and movement.” Faith-based schools also incorporate religious masses and curriculum. As a parent, how involved do you want to be? Many schools have parent committees, parent volunteers, or even open door policies where you can stop by whenever you like. Cooperative preschools give you the opportunity to become a regular part of the classroom experience. Determine your level of comfort with involvement. The costs of preschool can vary, and it tends to be one of the biggest deciders for many families. In Ohio, for age 4, full-time programs that include child care can cost between $4,000 and $9,000 per year, depending on the center, according to Child Care Aware of America. However, some part-time or full-time programs for age 3 to prekindergarten can cost up to $1,100 to $3,000 or more. If this information isn’t shared on a school’s website, be sure to ask during a tour. Also ask about the payment schedule. Is tuition paid in monthly installments, or are there lump sums due at certain times? Some schools offer need-based financial assistance or scholarships. Once you have narrowed down your list of preschool programs you want to explore, attending open houses and scheduling school tours is the next step. Have a list of prepared questions to ask at each school you visit. Child Care Aware of America offers a list of questions, including staff to child ratios, health and safety training, early childhood degree or credential, whether the preschool aligns with the state’s guidelines for early learning, discipline and nutrition policies. What can we as parents do to prepare our child, and ourselves, for preschool? The experts at a few area preschool programs shared some advice with us. Getting to know the new space they will be in everyday is important. Barbara Streeter, director at Hanna Perkins Center for Child Development in Shaker Heights, suggests taking pictures during visits to the school so the child can look at them later, and you can talk with them about what they had seen. Leeds recommends practicing independence at home with putting their shoes on by themselves, putting their toys away, and cleaning up their food from the table. Kristen is a mom, wife, educator, and blogger living in Cleveland Heights with her husband Dave, 3 year-old son Patrick, and 5 year-old nephew Nicholas. Kristen moved to Cleveland 11 years ago after living in southern Ohio all of her life. After graduating from Ohio University (Go Bobcats! ), she moved to Northeast Ohio, and has loved it ever since! Kristen and her family love getting out to enjoy all that NEO has to offer, and shares her experiences, both in parenting and NEO, on her blog www.readysetparenthood.com!